The Lāna`i Chamber of Commerce, with the support of the Mayor’s Office of Economic Development, will be holding Lāna`i Fifth Friday in Dole Park on June 29 from 5:30 p.m. to 8:30 p.m. The Chamber invites and encourages Maui County residents and visitors alike to come out and support Lāna`i businesses by attending the fun-filled party this Friday in Lāna`i City. 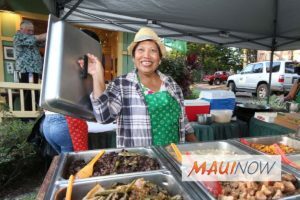 Lāna`i Fifth Friday will feature over 25 vendors and participants set up around Dole Park, including food booths and restaurants serving up local favorites, as well as several music and entertainment venues. During the event, local businesses displaying the Lāna`i Fifth Friday logo will offer discounts and specials. Shoppers should save their receipts to receive a free waterproof Lāna`i bag or tee shirt with total purchases of $100 or more at participating merchants, or buy the bag for $5 with purchases totaling $50 or more. Receipts can be turned in at the Lāna`i Chamber of Commerce booth. For those coming from Maui to experience Lāna`i Fifth Friday, the Lāna`i Chamber of Commerce has teamed up with Expeditions Ferry to provide a special complementary late-night return ferry. Guests wanting to take advantage of this special should call Expeditions (808) 695-2624 in advance, to purchase their Maui to Lāna`i one-way ticket, and to reserve a seat on the return ferry, which will depart Manele Harbor at 9:45 p.m.
On the evening of the event, those with reserved seats on the late-night ferry should stop by the Lāna`i Chamber of Commerce booth to pick up their complimentary late-night return ferry ticket. Shuttle service between Manele Harbor and Dole Park, Lāna`i City will be available through Rabaca’s Limousine Service for $10 each way or $20 round trip (cash only).